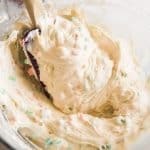 This Homemade Rainbow Chip Frosting recipe is so creamy and yummy, with tiny colorful chips of white chocolate throughout a sweet, slightly tangy, cream cheese frosting base! Before beginning to melt the white chocolate, prep everything you need by pulling out a silicone baking mat or lining a baking sheet with parchment and grabbing 4 small bowls, 4 spoons, and the food coloring you plan to use to color the white chocolate. Melt the white chocolate in a double boiler or a glass bowl set over a half-full pan of very hot, but not boiling, water. Alternatively, you can microwave the white chocolate, stopping to stir every 20 seconds, until melted. As soon as the chocolate is melted, divide it between the 4 small bowls and stir 2-3 drops of food coloring into each bowl. More food coloring may cause the white chocolate to seize up, so be cautious adding more. Spread the colored white chocolate into 4 small rectangles on the silicone baking mat or parchment paper, then refrigerate for 15 minutes. Meanwhile, prepare the frosting base by beating the butter and cream cheese together on high speed in a large bowl using a handheld mixer or stand mixer with a whisk attachment until smooth and creamy, about 3 minutes. Add the powdered sugar, 1 cup at a time and mixing at low speed until combined before adding the next cup. Beat in the vanilla and a pinch of salt and beat the frosting base until creamy. Once set, remove the white chocolate from the refrigerator. Transfer the colored rectangles to a cutting board and chop into tiny squares to make little chips. Using a rubber spatula, fold the chips into the frosting base, adding just 1/3 of the chips at a time to ensure even distribution. Frost your favorite cake or cupcakes and store any leftover frosting in the refrigerator. Just let it come to room temperature before using. Adapted from Not Without Salt via Sally's Baking Addiction.